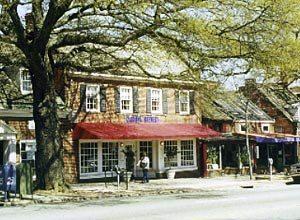 Chapel Hill has been described as the quintessential college town. The University of North Carolina is located in the center of this small city, with its main street, Franklin Street, serving as the front door to the campus. 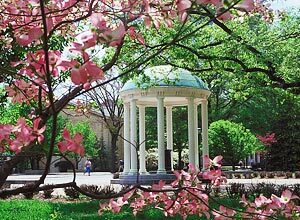 Despite all of the activity and sense of energy created by the presence of the 23,000 university students, Chapel Hill remains a quaint community with a village-like atmosphere and an easy pace. With a lifestyle enhanced by a concern for history and an obvious attention to protection of its natural environment and scenic resources, local government has gone to great length preserve trees, and create scenic greenways for pedestrians, numerous bicycle lanes, curbside recycling programs and the clean surroundings that its citizens desire. The quality of life here contributes greatly to the appeal of the area and makes it a great place to retire. Together with the neighboring cities of Durham and Raleigh, this metropolitan area is generally referred as the Research Triangle and is widely acknowledged as one of the country's leading centers for high-tech and medical enterprises. All things considered, this is a highly desirable and very welcoming destination for those retirees searching for a small college town as their choice for a desirable place to retire.